Why Is This Thing Hanging On Our Wall?! We enjoyed this display for some years, but I recently decided to try to recreate the original display - the one that was replaced by a pass-through, the display that showed close-ups of people we love. I wanted a display of photos that could be changed out easily. Eventually I hit upon the idea to slip photos between boards. So we we headed to Lowe's to get some 1x2s. My husband used a router to cut channels in the 8' long boards. We also brought home some hard board - the type wood used to make peg boards; the plan was to cut the hard board into 8"x10" pieces to slip between the channels in the 1x2s. After the wood was cut, we removed the old trellis display. Then we attached the 1x2s to the wall. I'll include a photo of the channels made by the router. 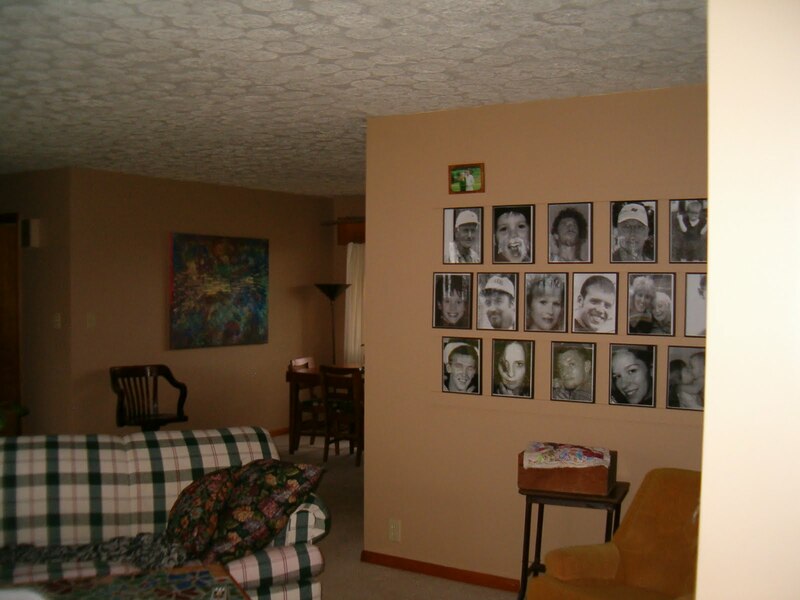 This photo, below, also shows some of the photos in place. The boards are spaced and sized so that the 8x10 boards can be slipped into the channels from the end of the display or from the front; the top channels are deep enough to allow this. Phew! This was a huge undertaking! 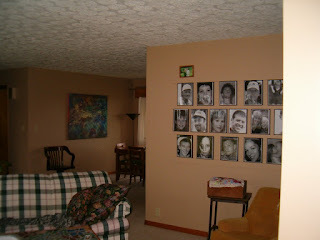 I glued over 180 photos to those 8x10 boards. I put pics on both the fronts and the backs so that I can switch the photos willy nilly from front to back. My rotary cutter, used in conjunction with a lazy Susan, helped make the trimming easy. But it was still a long process.